A personal care collection created with the freshness of natural mint and spearmint, enhanced by the goodness of antioxidants. Stay cool and collected with our aluminum-free, paraben-free deodorant infused with spearmint, mint and antioxidants from white tea, lemongrass, sage and tea tree extracts. The unique odor-fighting formula with baking soda and vegetable enzymes helps you feel fresh all day. Baking soda helps preserve freshness and absorb odors. A vegetable enzyme helps neutralize and block the effects of odor-causing bacteria to deliver gentle, effective protection. Antioxidants from extracts of white tea, ginger, aloe, lemongrass, sage and tea tree fight odor. This absorbent helps keep you dry. Fresh-smelling botanicals lemongrass and sage contribute to fighting odor-causing bacteria. Moisturizing aloe and witch hazel help soften and soothe skin. Aloe helps support healthy teeth and gums. Pure Mint Toothpaste contains antioxidants from extracts of white tea, ginger, grape, pomegranate and cranberry to help keep your breath fresh. The health impact of using artificial sweeteners and flavors is not well understood, but there is some concern regarding their use, so Arbonne avoids them completely. 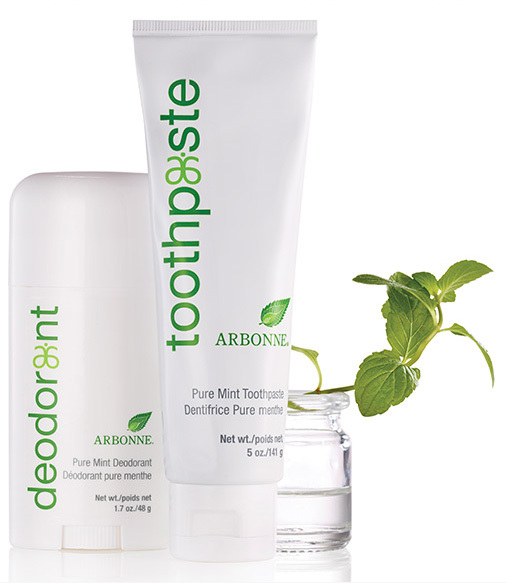 Pure Mint Toothpaste uses only the natural sweetener xylitol and natural extracts of mint and spearmint to produce a refreshing, minty flavor.